As the cast gyrate across the stage to the thumping percussion of Hector Bizerk's excellent hip hop score, the showman Zidler, played with Barnumesque ebullience by George Drennan, welcomes the audience to the 'naughty 90s' of fin-de-siècle France and into the heart of Paris's infamous cabaret, the Moulin Rouge. Zidler's opening address casts the audience as patrons of the club, establishing a relationship that is key to a solid production that explores notions of disability, objectification and agency. Written by Nicola McCartney and directed by Garry Robson, Crazy Jane follows the transformation of Jeanne Beaudon (the younger played by Rachel Drazek, the elder by Pauline Knowles) a neglected Parisian adolescent, into the captivating Jane Avril, muse of renowned post-impressionist Toulouse-Lautrec (Buchan Lennon), and the star attraction of the Moulin Rouge. Beaudon was afflicted from a young age by chorea, a movement disorder exacerbated by the mistreatment she receives at the hands of her abusive mother, played with all the wickedness of a Disney villain by Caroline Parker. The turning point in Jane's life comes with her admittance to the Salpêtrière Hospital, under Dr Charcot's one-size-fits-all diagnosis of hysteria. While interned in the asylum, Jane discovers a love of dance that enables her to overcome her disability and exploitation. 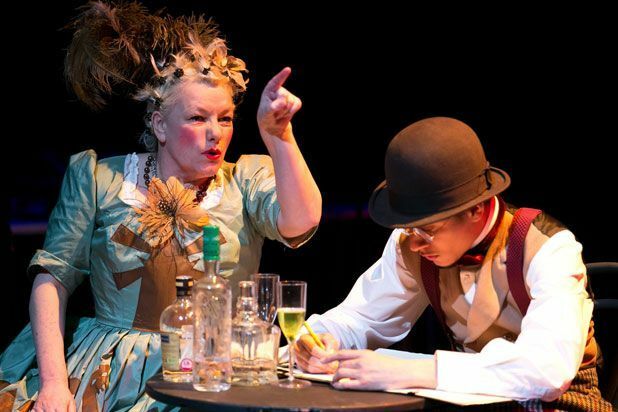 Culminating in a excellent dance sequence that celebrates Jane's triumph over adversity, Crazy Jane is a impressive production that uses a historical setting to take a contemporary look at the perception of disability in society. Jane Avril, star of the Moulin Rouge and immortalised in Toulouse Lautrec's iconic posters, cordially invites you to the Salpêtrière Asylum.